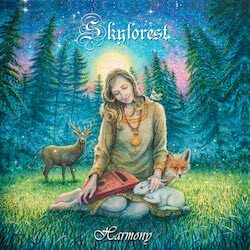 Russian atmospheric melancholic post black metallers Skyforest have just released their new EP, entitled “Harmony” via Depressive Illusions Records. ”Harmony” is an entirely acoustic EP, with soft, peaceful and dreamy compositions and it serves as a transition from “Unity” to what will come next eventually (hopefully in 2020). Apart from B.M. (the band’s mastermind) this EP features once again Michael Rumple in clean vocals (he’s now a part of Skyforest officially) and Arina Fox as guest singer in the title song (she also did vocals in B.M.’s other dream pop project Hiki, on latest album). The incredible artwork is by Sergey Shenderovsky, who once again was able to draw exactly what B.M. was imagining. Except for the digital formats, “Harmony” is also available in jewel-case edition CD with pit art limited to 500 copies with 4-page booklet including all lyrics and in tape edition limited to 66 copies with 2 sided color pro-cover inlay including all lyrics.